Tables, tables. All kinds of new tables in my living room this week! One is DIY and one is a clearance find. So..earlier this month, I had a few friends visit for the weekend. There was plenty of wine, giggling, gossiping, kitchen dancing, and singing. He went out to the garage to do man stuff. You know, like drink beer and listen to Aerosmith. And build stuff. He emerged two hours later with a barn wood coffee table for me. It morphed some in the few days it's been in the living room. One of the boards moved a little. But I think it just adds to the rustic charm. Next time we build something we will haul the wood inside to let it acclimate to the room temperature. But we like this one the way it is. On the bottom shelf, I added a basket from target to hold more magazines, remotes, and matches for the candles. He made this out of allllll barnwood. I'm still trying to decide if we want to add some kind of topcoat or finish to the top. It's still a tad rough around the edges, so it could use a little more sanding at the very least. But I'm researching finishes now... maybe a wax topcoat. Oh you spotted my little gold table? That is the golden deal I was telling you about. My mom and I spotted it on a Target haul. It was in the clearance section for 29 bucks. It went right in the cart. The new golden beauty adds just the right touch of glam to the rustic in the room. $29 is my kind of price. The ottoman still has a spot in the living room. It moved over to the window with a few pillows. Prime bird watching spot for Scout. you don't see those puppy paw prints on the floor...do you? NEXT STEP: Now to find a new (larger) area rug. I'm thinking something more plush with a short shag. We love the pattern on this rug, but it's actually and indoor/outdoor rug we picked up from Menards, so it isn't very cushy. Plus, we'd like more rug space so we can spread the furniture out. He built it from scratch, with just a picture in his mind. He remembered that I wanted a coffee table with a bottom shelf. He did not remember to take photos during the process. Bad blogger husband. But I think I can forgive him. Do you think it's ok to mix rustic & glam? Do you have any barn wood finish suggestions? I want to keep the look but add a little protection. oooh Adam did a great job. Love the table and the look that the golden beauty adds! thank you thank you! we love goldie too. 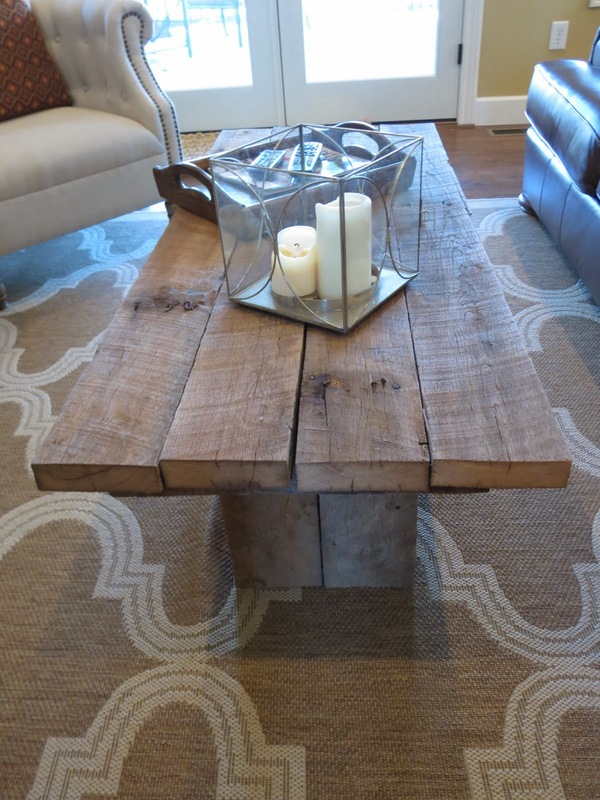 Love both of these tables, perfect blend of rustic and glam! Adam did a great job on the coffee table! Thanks Ashley, we are loving the mix. 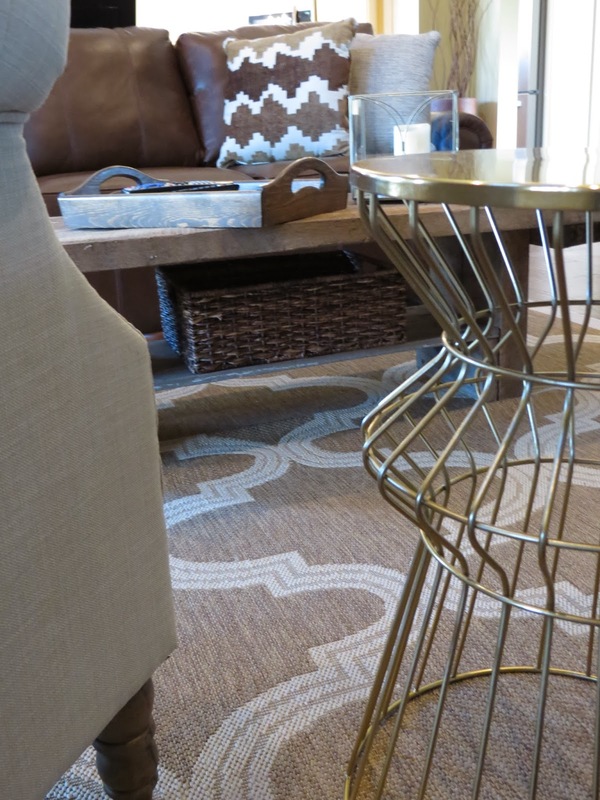 I love how both tables look together and in your living room! I've been eying that gold table for a while. Glad to see it's beautiful in a real life space! Wow, I love your living room! I think it's totally okay to mix rustic with glam especially if you can do it right---which you do! 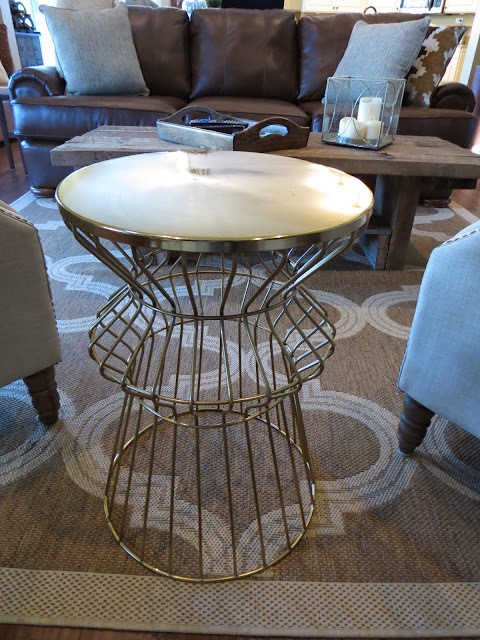 I'm so drooling over that gold accent table, and that barn table...swoon! I love the mix! Both tables look great, and I like your current rug too. The room is looking great! Whoa!! This room has come so far from the lawn chairs!! It looks so perfect! !